Local home builders give their perspectives on the coming year. There’s something about beginning a new year that makes us all want to reevaluate our lives, our work, and our future. The start of a brand new year seems like the perfect time to start fresh or just to begin planning ahead. Labor: Shortages throughout the construction industry have been a concern for the past several years. How will that play out this next year? And how is the industry working to resolve the situation? Land: The supply of available land within the metro has been declining, and the price of available lots in surrounding areas continues to rise. How are cities working to make development more accessible? Or are regulations making development more difficult than necessary? Material: Since the downturn in the construction industry, many manufacturers cut back production, and some sectors have not returned to pre-2008 levels. How is availability of materials affecting construction schedules and budgets? Financing: Interest rates are expected to increase in 2016 after several years of record low rates. How will this affect construction financing or home sales? How much is the mortgage market a factor to local home builders? Read on to find out what some experienced local home builders and developers see in the cards for 2016. “The labor shortage is a concern in every facet of the industry, from skilled trades on down to just hands-on laborers,” Johnson says. Although he believes the shortage has remained fairly level for the past year, he says the plumbing and HVAC trades seem to be the hardest hit, in part because of the lengthy apprenticeship system. Johnson says evaluating the apprentice programs in those skilled trades would help improve the labor situation, but he echoes the view of many in the industry: The root cause is an underlying attitude in society about the trades. “Fewer and fewer people want to do the actual work. A lot of people are willing to sit at a desk and do the management, but they don’t really want to get out on the job and get dirty. You have to do that part if you ever want to be the manager. And you have to be willing to go get dirty when you are the manager, too,” he says. Accurate develops ground primarily in Urbandale, where the company is able to buy enough acreage to do a full community with an overall master plan, creating a lifestyle and not just a development. “That’s become our niche, with most of our homes at the executive level,” he says. Because Accurate builds at a higher price point on land it has developed, lot prices and availability have not been a factor for the company and will not be a concern for the coming year. “The order time on a lot of materials has gotten a lot longer,” Johnson says. “And that’s still going to be an issue this year.” Suppliers that used to stock popular items, from flooring to siding and plumbing and lighting fixtures to cabinetry, are keeping less in stock since the economic downturn, according to Johnson. “Things that used to have a lead time of two weeks typically take five weeks,” he explains. “And if there are changes during construction, it really affects our ability to stay on schedule.” Because of that situation, Johnson says Accurate has to maintain regular, detailed communication with clients in order to avoid added costs and delays. As with other developers, Accurate has never seen financing as an issue with its clients. He says a variation of three to four points in the interest rate doesn’t typically affect whether potential clients will be able to buy an Accurate Development home, so the anticipated rise in interest rates for 2016 is not expected to affect the work load. Kevin Johnson, President, Accurate Development. For nearly 25 years, Kevin Johnson has been building quality homes in central Iowa. One of Builder magazine’s America’s Top Builder award winners and recipient of Iowa Realty’s Award for Excellence, Accurate Development takes pride in its reputation for high quality and fine craftsmanship. In fact, Happe Homes recognizes that it’s deeper than just having the right number of employees and has been considering alternate ideas for resolving the issue. Training skilled workers takes time, and qualified laborers is an immediate need. So Happe Homes is testing a pilot program with its trade partners to help the process work more efficiently. One of the concerns for many in the real estate and construction fields is the lack of new construction homes under $250,000, virtually eliminating first-time and starter-home buyers from the market. “It’s nearly impossible to build a quality home for $200,000 if your lots costs are already over $30,000,” Byers says. As with many larger builders, Happe Homes hasn’t suffered as a result of changes in financing availability. “We try to work with everyone throughout the entire construction phase to avoid any unnecessary financing concerns or delays,” Byers says. “And because we build more houses at the same general price level, we have less overhead. That allows us to be more efficient and more flexible as interest rates change. Jim Byers, Operations Manager for Happe Homes. With a mission to be a preferred builder in central Iowa, Happe Homes seeks to build quality homes at a fair price. Its team of professionals has expertise in single-family, multi-family, and development, and is the only builder in Iowa featuring Control 4 Smart standard features in every home it builds. “Our trade contractors and vendors continue to struggle with obtaining employees,” King says. As a result, building times and remodeling project schedules have to be longer. King sees an opportunity to address the situation at the high school level, aiming for a long-term change rather than a temporary fix. “Students should be encouraged to look at all career paths, not just in business and IT but also in the blue collar world,” he says. King sees a number of issues at play in the cost and availability of lots for builders and homebuyers. “The price has escalated over the years, making it a challenge to build an affordable home on a lot that a potential homeowner is happy with.” He believes that part of the cause for those rising lot prices is increasing government regulation. In order to address the inflated lot prices, King suggests more discussion needs to take place across the board. According to King, the delays in materials are directly connected to the labor situation. “This is yet another area where the labor shortage has caused problems due to the production capability that results from fewer employees.” Because of longer lead times for production and the delivery of so many products and materials, schedules, and the entire construction process are negatively affected. However, King says building within a realistic budget can always be achieved, no matter what the interest rates might be. Colin King, CO-OWNER, K&V Homes. Named Builder of the Year by the HBA of Greater Des Moines several times, K&V Homes has also received numerous HomeShowExpo awards. Co-owners Colin King and Dean Vogel back that award-winning reputation with Master Builder designations, decades of experience, and a talented team of professionals. “The labor situation certainly hasn’t gotten any better,” Kimberley says. “It’s a serious problem.” Kimberley adds that rising prices from subcontractors are a direct result of the labor shortage. Kimberley believes an ever-increasing affluence in the United States has led to a generation of young people unwilling to work, which is also affecting the labor shortage within the construction trades, as well as other industries. Though Kimberley doesn’t see a dramatic shortage in available land, he says some communities are making it difficult for developers to build there. Kimberley says there’s only so much a builder can do about rising land prices, but excessive regulations can be avoided. “The more regulations a city puts in place, the less likely builders are to work there,” he explains. As a result, Kimberley says, builders have to work harder at scheduling to coordinate long lead times with installation and construction crews. Despite the anticipated interest rate hikes, Kimberley doesn’t see this as a factor in local home sales. “We haven’t really been affected by changes in the interest rates,” he says. Kimberley Development homes are typically for move-up buyers. Those buyers usually have established credit histories, already own a home, and are not applying for first-time mortgages. These factors, as well as Kimberley Development’s long history of home building, allow the company to adjust as the mortgage market changes. Bill Kimberley, President, Kimberley Development. 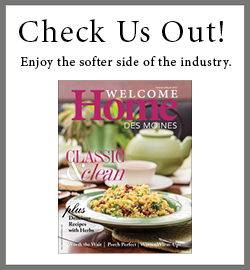 Voted Ankeny’s Best Builder 10 years and Favorite Home at the HomeShowExpo a record five times, Kimberley Development has earned a reputation as Greater Des Moines’ premier custom home builder for more than 38 years. Because fewer skilled laborers are working, those available are able to charge more, which is affecting the price of homes as well. “It’s helped us that we build a lot of homes and that we’ve used the same companies as subcontractors for years,” Ried adds. Ried also observes that the labor issue will continue to be a greater concern for the skilled trades in the coming year. “Because we have a number of lots in inventory, land availability is less of an issue for us,” Ried says. He adds that the price of land continues to rise and will be an ongoing factor in 2016. Ried says the financing options and mortgage products themselves are not having an effect on construction loans or funds availability, but regulations are always a factor and can be hard to always plan for. For example, Ried says one of the new standards requires a new home to sit unoccupied for 10 days after completion to allow adequate time for the appraisal phase. Jake Ried, owner, Neighborhood Builders. Twice awarded the HomeShowExpo “People’s Choice” award, Neighborhood Builders has been designing and building in central Iowa since 2006. Neighborhood Builders is known for building homes as unique as the homeowners who live there, each one an individual project and not a cookie-cutter house. At TS Construction, they’re trying to gauge those varying schedules well in advance to prevent delays and added costs, which means keeping good communication with trades, suppliers, and crews throughout the build. Stevens says most of his firm’s clients come with a lot already purchased. However, he acknowledges that it is getting harder and harder for home buyers to find affordable land. He adds that this is one reason new-home prices continue to rise as well. “We typically build at the middle to upper end of new-home prices,” he says. But he believes builders trying to reach that under-$250,000 buyer will struggle as lot prices escalate. Because of this, lead times are much greater, and builders must adapt in order to maintain schedules and keep home buyers satisfied. Stevens says he provides home buyers with a list of decisions to be made, indicating the most important selections and the items with the longest required lead times. Although Stevens says he expects interest rates to rise in the upcoming year, he doesn’t see it as an issue for most builders. “Slight fluctuations in the interest rate don’t typically affect builders to a large degree in their business,” he says. In fact, Stevens says the threat of rising interest rates could even have a positive effect for some looking to build new homes. “In some ways, the changing interest rate will likely free up more people to build. Tom Stevens, owner, TS Construction. Tom Stevens, one of the few builders in Iowa to achieve Graduate Master Builder status, began his construction career as a framing contractor. The TS Construction belief that each detail is as important as the next has resulted in Builder of the Year recognition twice.